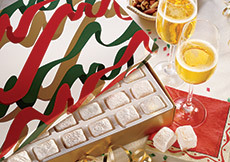 Generous gift boxes to please a crowd! 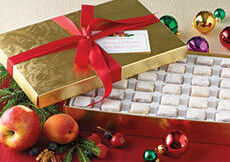 The fresh and fruity flavors of our classic candies make them a treat your guests will reach for again and again! 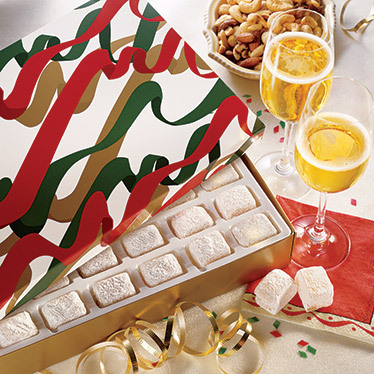 These extra-large boxes arrive evenly-divided between Aplets & Cotlets and Fruit Delights candies, and are perfect for office parties, large families, and holiday events. Kosher. 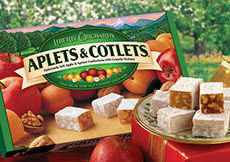 INGREDIENTS: Aplets & Cotlets sugar, corn syrup, walnuts, modified corn starch, pectin (pectin, disodium diphosphate, sodium polyphosphate, dextrose, dicalcium phosphate), natural flavors, apricot purée, apple juice concentrate, sodium citrate, citric acid, malic acid, soy lecithin. ALLERGEN INFORMATION: Contains soy and walnuts. May contain traces of peanuts and tree nuts not listed in the ingredients. 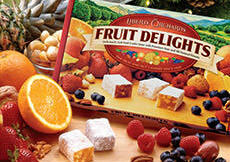 INGREDIENTS: sugar, corn syrup, nutmeats (walnuts, pecans, macadamias,cashews), modified corn starch, fruit [fruit juice from concentrate (peach, strawberry, blueberry, raspberry), candied orange peel, pineapple, raspberries], pectin (pectin, disodium diphosphate, sodium polyphosphate, dextrose, dicalcium phosphate), natural flavors, sodium citrate, citric acid, malic acid, soy lecithin. My brother-in-law from Portland, Oregon, sends me these for special holidays. I have learned to look forward to these wonderful treats. But, I live in Louisiana and cannot find them here in Shreveport. Why? E RIGGS Liberty Orchards reply: Thanks, Earline. We're sorry they're not available to you in Shreveport. We simply don't have much retail store distribution in your part of the country. 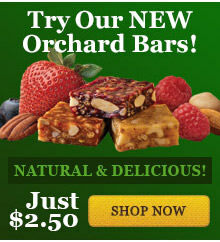 However, we're delighted to serve you through our website and catalog. Happy Holidays!